Young people can be inspirational, and we want to celebrate their musical achievements. Finding out a little more about them, their experiences and their ambitions for the future will, we hope, inspire others to pick up an instrument, or sing, or join an ensemble. 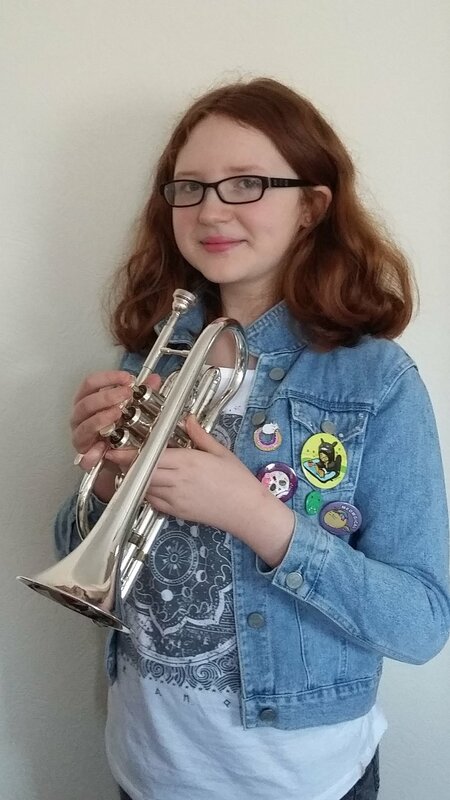 We recently met Freya, 12, who is a member of Portsmouth Music Hub's Wind Bands and Portsmouth Plays On. How old were you when you first started playing an instrument? I started off playing the oboe but switched to cornet when I was 9. What do you love about playing your instrument? I love the cornet because it makes a lovely sound. What ensembles, bands, or school music groups are you part of? I play in the Portsmouth Plays On Orchestra, and Coastal and Channel Wind Bands. Which musician or composer inspires you? I like a wide range of music, but I really enjoy music from films because it its so dramatic. Jo Hisaishi is a Japanese composer who created lots of music for the Studio Ghibli anime films. I'm inspired by both the art and the music. I'm listening to Pink because she writes her own music which is often inspired by her life. Tell us about the most exciting musical experience you have been involved in? It's hard to choose because I've been in quite a few Music Hub performances. I especially love the ensemble concerts because I get to play along with others but I also enjoy the performance evenings where I can perform what I've been learning in my lessons. I love all things creative. I'm not sure exactly what I want to do but it'll definitely be creative. What do you think is the best part about music? I think the best thing about music is how it inspires people - it can be emotional and moving. What advice would you give to other young people who are thinking about playing an instrument? It takes lots of practice to become good. Keep going and eventually you will sound amazing. We met Molly, who is 6 years old, and attends Langstone Infant School, in Portsmouth. I love the sound of the violin. I play in the Portsmouth Beginner Orchestra, which I really enjoy because I love playing my violin along with all the other instruments. The amazing violinist Paganini. He broke all his strings except the G string so he could show off. 'The Nutcracker' because I went to see it in October. I like the March because it is lively and energetic. Performing in my first concert when I played 'Loch Loman', that I wrote myself. That I can play with other people. Try out lots of different instruments to see if one fits you. Earlier this year we met Emily, she's 18 years old and currently studying at the Royal Academy of Music in London. I went to Springfield Secondary School in Portsmouth, and then Richard Taunton’s Sixth Form College in Southampton. I am now studying for a Music degree at the Royal Academy of Music. I would have been 10 years old. I think the trombone ‘sings’ more than any other of the other wind instruments because without any valves, keys or buttons, the trombone has a very natural sound which is flexible and smooth like the human voice. Playing the trombone is also very versatile, meaning I can play in many different groups and as well as a soloist – you can play in an orchestra, wind band, jazz band, military band or as backing in a pop group. A trombone section can sound loud and bold over the top of a symphony orchestra, or beautiful and mellow. I have had piano lessons in the past, but I find it difficult mainly as I am used to only reading one note at a time when I play the trombone! Now that I am studying at the Academy, I have to play piano every week in class so I am practising a lot more and slowly getting better! I think playing the piano is an important skill for a musician to have as it teaches you so much about harmony and chords – it is actually one of my goals to get my grade 8 on the piano! I first started with the Ready 4 Music whole-class brass teaching in Year 4. My first experiences of playing in an ensemble was in the Portsmouth Music Hub’s Junior Orchestra and Junior Wind Band which was at first very overwhelming having only played duets with my teacher. It soon got easier and I later moved up to Senior Wind Band and Highbury Area Band. I now play with HMS Collingwood Volunteer Band which is linked to the Royal Navy but run by the Royal Marines Band Service, and I really enjoy playing as there are many experienced musicians to learn from, and the rehearsals are often very entertaining – particularly when we are marching and playing at the same time! Here at the Royal Academy I play in a trombone quartet, a brass trio (trumpet, French horn and trombone), a trombone choir with 21 others, and in a lower brass class made up of trombones and tubas. Once a week we have a woodwind, brass and percussion orchestral repertoire session which I especially enjoy as we have professionals often from the London Symphony Orchestra or London Philharmonic Orchestra coming in to conduct us who pass on a lot of valuable knowledge. I can remember quite clearly the first piece of music that really inspired me – it was a wind band arrangement of Pirates of the Caribbean that I played at Highbury Area Band. The music was so loud and exciting, I knew then that music was something I wanted to do for the rest of my life. There is so much great music to be inspired by! I love listening to lush orchestral music by composers such as Brahms, Dvorak, Gershwin, and Beethoven, and Bernstein and I also love choral music by composers such as Verdi, Mozart and Faure. I like listening to recordings from around 1908 of one of my trombone heroes Arthur Pryor, and also to various brass chamber groups such as Mnozil Brass who are not only all incredible players but are also hilarious to see live too! Lots of musicians have inspired me since I started playing the trombone and they have all inspired me in different ways. Most importantly, my teachers have all had a big impact on me: my first teacher Simon inspired me to enjoy playing by encouraging me and by making my lessons fun, whilst my following teacher David along with many other people inspired me to push myself harder and aim high, and to believe in myself more and not to give up! Now I am studying in London I am surrounded by many amazing musicians in both my peers and my many professors – my new trombone teacher plays in the London Symphony Orchestra and he has already taught me so much, it is amazing that I have a whole four years to learn and be inspired here. At the moment I am listening to Johann Strauss’ ‘Die Fledermaus Overture’ as in November I have to play the trombone part in an audition amongst other pieces. It reminds me of the New Year Day concert which is on TV each year and I love! My favourite musical experience to date was playing a solo in the Royal Navy Volunteer Band Festival in Plymouth having been chosen by HMS Collingwood to be the soloist for the that year's competition. It was the first time I performed from memory (no music was scary!) and there was a huge supporting crowd in the audience. I played as well as I could have done and to make the day even better I won the trophy for best soloist! Other highlights include playing a piece called ‘The Acrobat’ at The Kings Theatre dressed up as a clown, going to watch a concert at the Royal Albert Hall in London for the first time, and finding out that I had passed my ABRSM Trombone Diploma after so many months of hard work. I am not 100% sure what I want to do when I leave the Royal Academy, but I have wanted to join the Royal Marines Band Service for about 6 years so it is very likely that I will audition there in the future. I know that I want to play the trombone, but apart from that I am trying to keep my options as open as possible as there are going to be so many wonderful opportunities over the course of my degree I do not want to miss out on anything. For me, the best and most important part of music is its ability to bring people together. In Collingwood Band there are young people of my age, and some older people, and professional musicians and people who play music once a week just for fun. You don’t have to speak English to read the music, and you don’t have to speak English to understand the emotions of the music – whether joy, sadness, peace or anger. Everybody can join in and enjoy making music together which is the important thing. If you are thinking about it, then just give it a go! You will never know what fun you are missing out on if you don’t try! Learning an instrument is not always easy all of the time, and nearly everyone I know finds practise boring at times (including me), but once you have finally mastered a tricky piece, play in an ensemble and feel goose-bumps from the music you are part of, or finish a performance and hear everybody clapping then suddenly everything feels worthwhile. My one musical wish would be for more young people to give classical a chance. So many people, both children and adults, seem to think that classical music is 'boring', 'screeching opera' and 'long' which isn’t true at all! People love film scores to movies like Star Wars, Harry Potter, and Pirates of the Caribbean and everyone sings along, not realising that this is classical music, and that the composers were often inspired by other classical music!